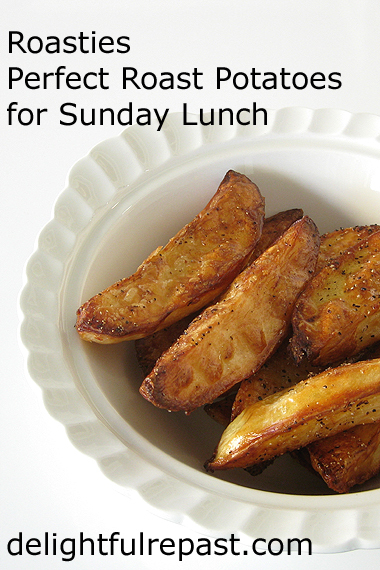 Roast Potatoes, also called Roasties, are one of the key players in the British Sunday Lunch (or Sunday Roast). Served alongside Roast Beef, Roast Pork, lamb or chicken (or my Braised Brisket), Yorkshire Pudding and two vegetables, it’s a tradition that’s unstoppable. You can season this any way you like, but I usually keep it classic. Since achieving the perfect texture is job one, it’s important to start with the right potato. In the UK, try King Edward, Maris Piper or another floury, rather than waxy, potato. In the US, russets work beautifully. Make only the quantity you’ll consume at that meal. Don’t make “extra” as they don’t really reheat all that well. Are you a roast potato fan, or is this something new for you? Once you’ve had perfect roasties, audibly crunchy on the outside and fluffy on the inside, you’ll want to have them all the time! 1 Peel the potatoes and quarter them (I often quarter them lengthwise as pictured). Place in a large pan with 1 teaspoon of salt and enough cold water to cover the potatoes. Bring to a beginning boil over high heat; reduce heat to medium, cover loosely and simmer for 5 minutes. Start the timer at the “beginning boil” stage. 2 When you first start cooking the potatoes, preheat the oven to 425F/220C/Gas7. Spread 2 tablespoons of oil in an 18x13x1-inch half sheet pan. Note: A 13x9x1-inch quarter sheet pan is perfect for a half recipe. 3 About 3 minutes into the 5-minute simmering of the potatoes, put oiled half sheet pan into the oven. 4 Drain the potatoes thoroughly, put the lid on and shake the pan gently several times to give the potatoes a bit of a bashing to rough up their surfaces without breaking up the potato quarters. Remove the lid and leave the potatoes to dry for a few minutes. 5 Carefully place the potatoes in a single layer in the hot oil. Drizzle with (or brush on) melted butter and remaining 1 tablespoon of oil. Sprinkle with pepper and 1/2 teaspoon salt. Roast for 15 to 20 minutes. Turn the potatoes and roast for another 15 to 20 minutes; repeat once, cooking until the potatoes are well browned, crisp and tender, about 60 minutes total. Serve immediately. I don’t dislike potatoes. They just don’t add enough to my life to be worth the drain on my carbo-starch quota. Was being interviewed in a broadcast studio a long time ago where the governor of Idaho – forget which one, might have been Cecil Andrus – was doing a potato commercial. When he was off mic, he did a rendition listing all the ways he could prepare a potato that I couldn’t quote here which was hysterical. Very colorful – mostly the color blue. I know what you mean, Sully. Only with me, it isn't potatoes I feel that way about--it's store-bought and less-than-stellar desserts. Those things just aren't "worth the drain on my [sugar] quota. I'm sure my list of all the ways I can prepare a potato isn't as "colorful" as the governor's! I love roast potatoes, yummm! Actually I love potatoes in nearly every way shape and form - that's the Irish girl in me! I do, too, Debbie! But really good mashed potatoes are my favorite! We will be making these roast potatoes to go with our Christmas dinner, Jean. Roast potatoes are an integral part of a roast dinner, Christmas dinner. I am in the process of getting the ingredients to make our Christmas cake. I have left it a bit late. Oh well, I'll just have to ,"feed," the cake with brandy, twice a day instead of once a day, when it is baked. Now you're in the world"
Slightly got off the point of roast potatoes but it is,CHRISTMAS!!!!" .....nearly. I love a roastie or two, of course, and I do like the look of your fine examples. I don't think I'd have the courage to talk about roasties, though. The fact is that I can't think of many foods more likely to start a major disagreement over here. You're likely to find that everyone has their favourite way and won't hear of any alternative. I did hear an argument recently over beef dripping or goose fat for Christmas roasties. They look delicious!I love potatoes in every way too. Tony, yes, the advertising is massive. It used to start up after Thanksgiving (4th Thursday of November), then a bit earlier and a bit earlier, until I'm not even sure they wait until Halloween is over. I'm likely to make a fruitcake any time of year, so … have fun with that--it is fun to add brandy to it at intervals! Martha, when I think of the quantities of roast potatoes or mashed potatoes I used to eat when I was a kid … (*and* stayed skinny and energetic all the while!) but now I eat much smaller servings and less frequently. But I don't put any food that I like "off limits." But, hey, whatever works, right? Thank you, Angie. That would be nice, but those days are gone for many of us! I'll try your roasties the next time I'm making a roast or steak, Jean! They sound utterly yummy with their fluffy interior and crunchy exterior. Thanks for sharing your recipe! Thanks, Kitty. Do let me know how you liked them. Yum! My son inlaw makes some killer roasties. He learned from his Mum in England I'll have to give these a shot. I agree, Jean: it's all about the outside crunch! Delicious. Thanks, Gary, I hope you'll try them soon and let me know how they turned out for you. Thanks, Pauline. Gotta have that crunch! I love potatoes. I enjoy golden and red potatoes the most but I can do russet if they’re crispy on the outside. Thank you, Alice. I've never met a potato variety I didn't like! Thanks, Ellen. Crusty is always good! Oh boy howdy! That sounds good for breakfast so I am going to get started. Thanks for this method. MC&W, I missed out on a lot of them because I would always choose mashed potatoes over any other! Briony, I sometimes leave the skin on as well, but it does cut back on the surface area of that wonderful crunch! Vee, I've never thought of having them for breakfast! What a great idea! I could eat these by themselves for a meal! They look fantastic, Jean! Thank you, David! I must admit I've been known to make a meal of them! These sound so delicious! My husband loves his potatoes, and I know he would love these! It must be great to eat roast potatoes in a warm room when it is a cold autumn day. Happy new week to you. RTC, thank you. Yes, it is wonderful cold-weather comfort food! I love these, Jean, and make them every once in a while. I like potatoes just about anyway. I just had a baked 'loaded' potato for lunch today...a complete meal in potato form. I think it is the Irish in me that loves a good potato dish. Thanks, Lisa. Yours was such a great post on such an important topic, I just had to share it. I'm sure it will help many people. Well they do look delicious. Wedges here unless they are larger.. Thank you, Margaret. Yes, they are larger than wedges. Each of these is one-quarter of a 12-ounce potato. Karen, so glad I could help! It seems a little "fussy" at first, but once you get the technique down, you can't miss! I have to admit that I've never been able to produce a really good roast potato, not sure why. I have to give your recipe a try, it looks very tasty. Thanks for sharing, Jean. Oh wow these look super scrummy!! perfect for this ridiculously cold day! Thank you for sharing this with us at #TriumphantTales. I hope to see you back next week! Amalia, I'm sure you can do it! Just follow my recipe exactly, and you can't go wrong! Let me know how it goes. Thanks, Lianne! Yep, see you next week. These look absolutely delicious! Roast potatoes really make a meal complete for me. And Yorkshire Puddings! Thank you so much, ARTW! And don't forget the gravy! Thanks, Kate. Yes, goose fat! Though it's been so long since I've had it, I can barely remember. Your roast looks sooo good, Jean, and those roasties have to be delicious! With Yorkshire pudding, that has to be a treat to sit down to. I no longer make Sunday dinner. Hubby treats me to dinner out on Sundays for which I am thankful. It's nice to have someone wait on me one day a week! I will definitely try making your roasties. I think they will go over very well. Happy Thanksgiving! Thank you so much, Sandi. I certainly don't make it every week--I get lazier all the time! Dinner out every Sunday sounds like a grand idea. Thanks, Daydreams! I'm the same way, can always make a meal of potatoes and gravy! I somehow missed this post. 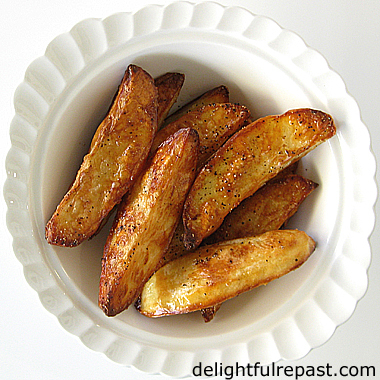 These roasties are a nice, healthy alternative to fries! Thanks, Margie. And they are soooo much better than fries! Oh, Noleen, thank you so much! There's nothing like gravy and potatoes. While I pre-boil chicken before putting it on the grill I have never pre-boiled potatoes prior to roasting. Great suggestion. I am definitely giving your recipe a go. 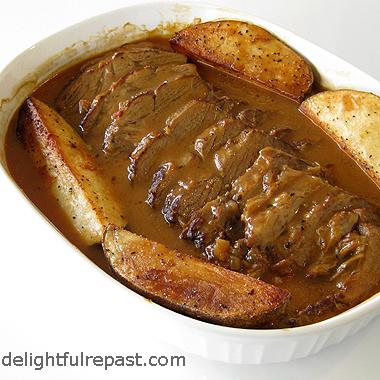 As always you make the potatoes and pork with potatoes meal look so appetizing! Aaaww, Sue, thank you so much. Just remember not to overdo the boiling. You just want to cook the outer layer and rough it up a bit. Thank you Jean for linking up with us at the #BloggingGrandmothers End of the Year Link Party 2018! Party ends January 5, links are unlimited so feel free to add more!